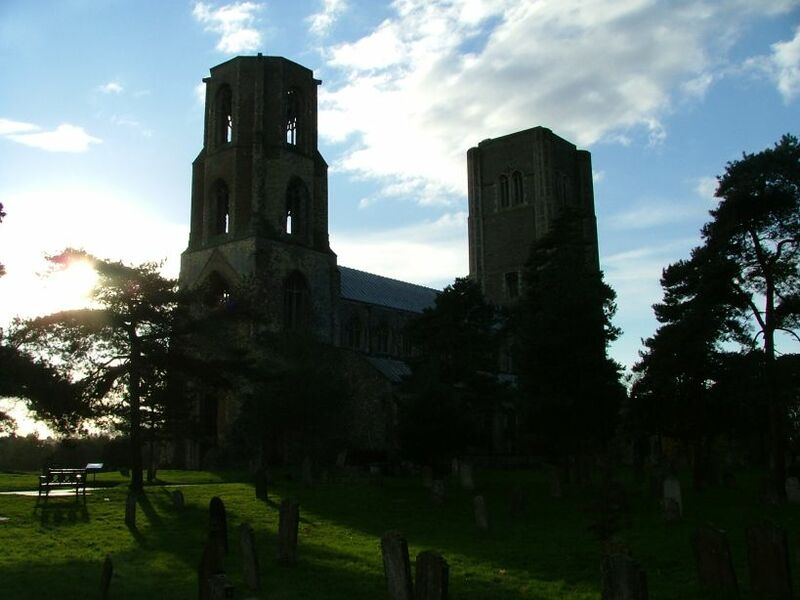 This massive church and its famous twin towers will be familiar to anyone who has ever been within five miles of Wymondham, pronounced Win-d'm; its presence always there above the roof tops, and still there on the horizon when the rooftops can no longer be seen. Closer to, it is like a mighty city on a hill. 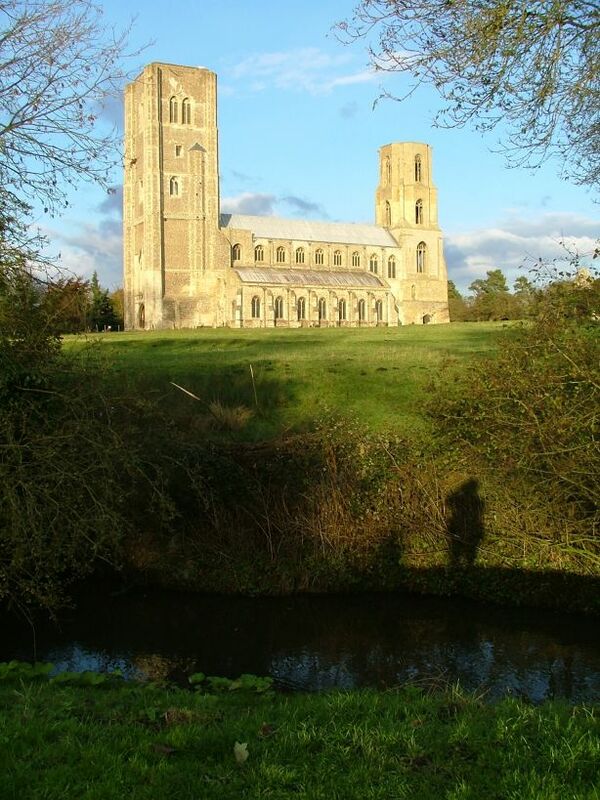 It is often referred to as Wymondham Abbey, which isn't entirely correct; but there was an Abbey here, and you can see a scattering of remains in the fields between the church and the river, gradually reduced over the centuries as the stone and rubble were taken away for use elsewhere. 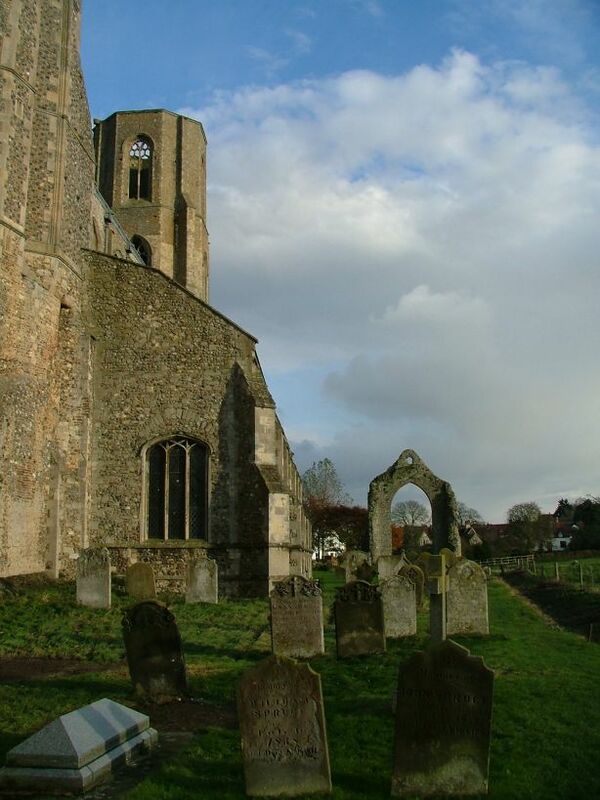 We came to Wymondham on a day that was breathtakingly cold; although the temperature was hovering around freezing, there was a biting east wind that made it feel colder still. 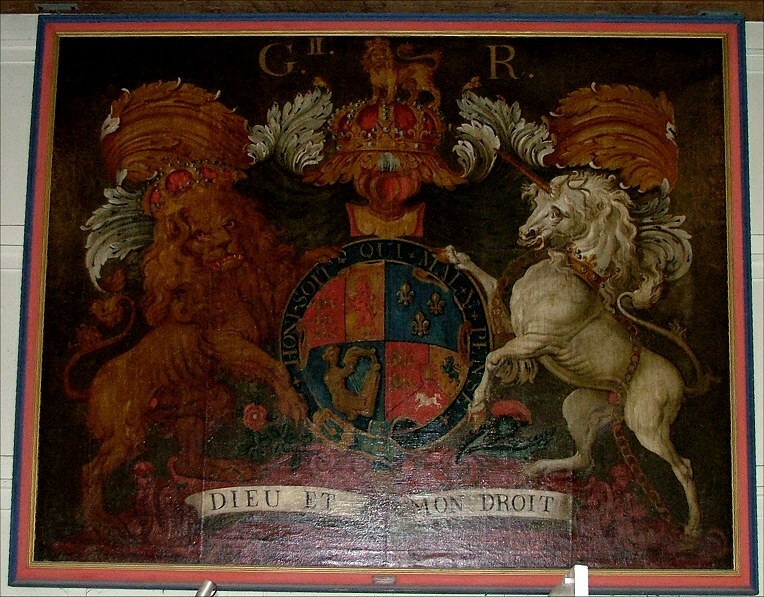 Hence, the clarity of the light in the photographs above. The top photograph, taken from the south on the far bank of the river, is worth a second glance, because it provides a number of clues as to how this extraordinary and magnificent building came to be the way it is today. 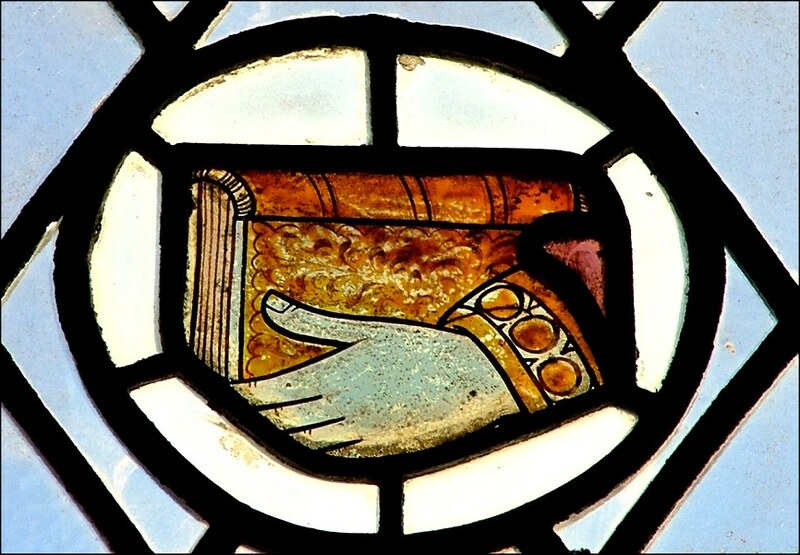 In the beginning, there was a Benedictine Priory, an offshoot of the Abbey of St Albans. 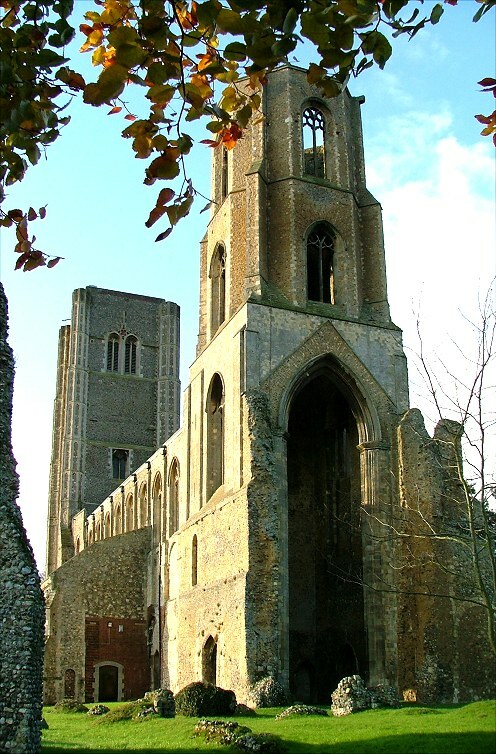 It was founded here because, after the Conquest, William I granted the lands of Wymondham to the Duc d'Albini, and the Duke's brother was Abbot of St Albans. 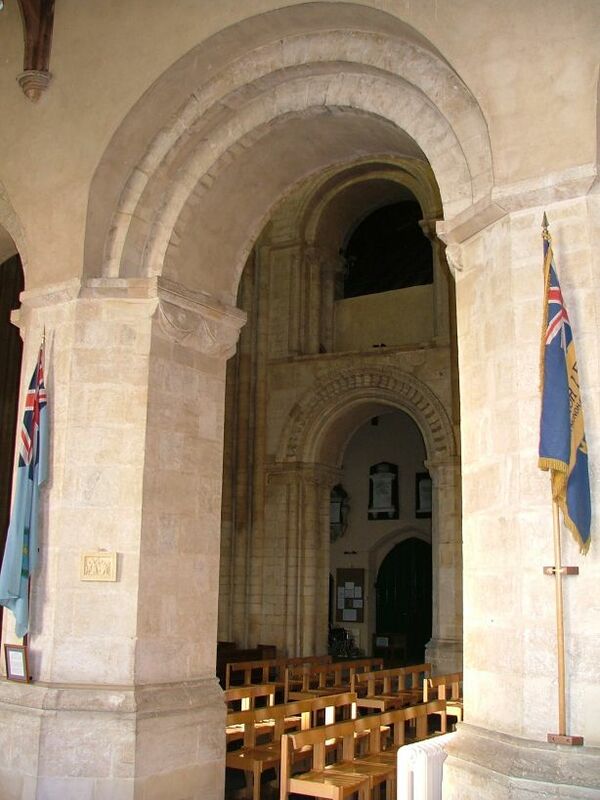 Part of the project consisted of building a massive Priory church, much bigger than the one you see today. 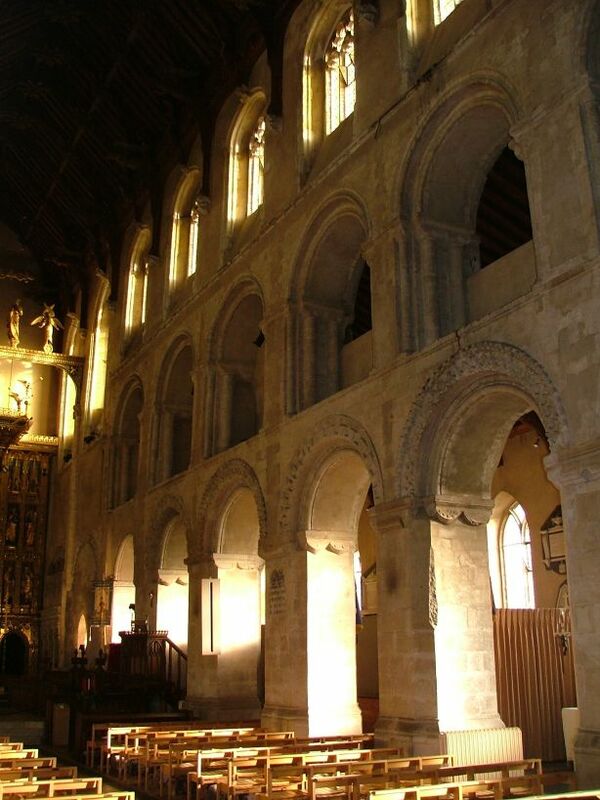 In style, it was like the Abbey church of Bury St Edmund, or Ely Cathedral. It was a cruciform church about 70 metres long, and had twin west towers - you can see something similar today at Kings Lynn St Margaret. 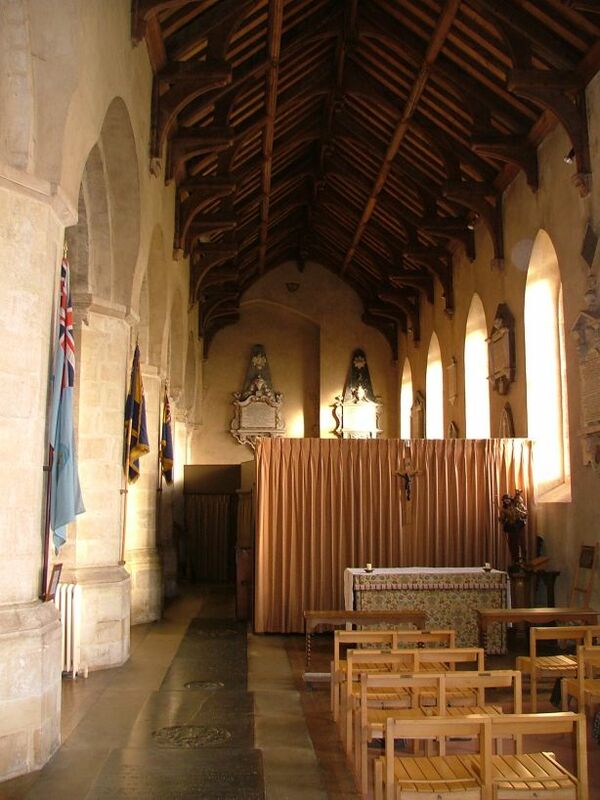 As at St Margaret, there was a third tower above the central crossing, the chancel extending a long way eastwards, and transepts that were as tall as the nave roof. 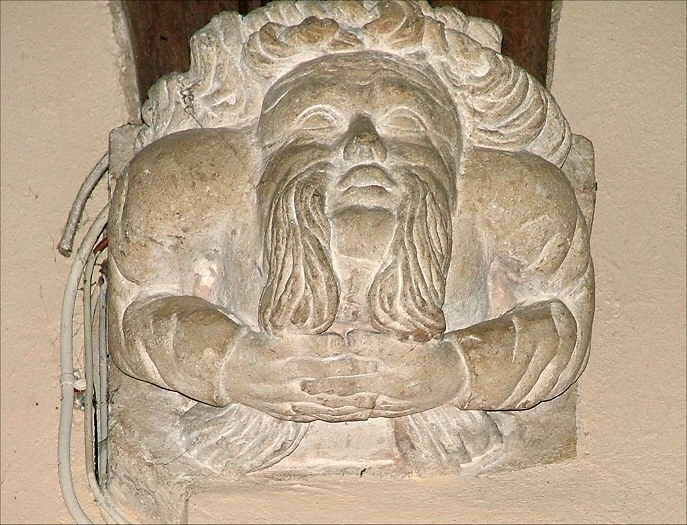 It was completed during the 12th century. 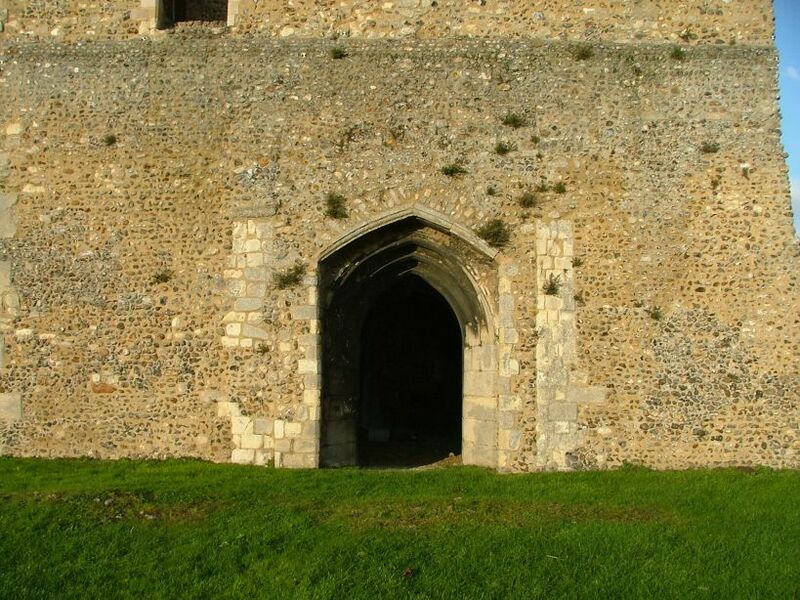 You can see a surviving trace of the south-west tower in the photograph above. The base of its northern wall rises above the roofline at the western end of the clerestory, just beside the current west tower. 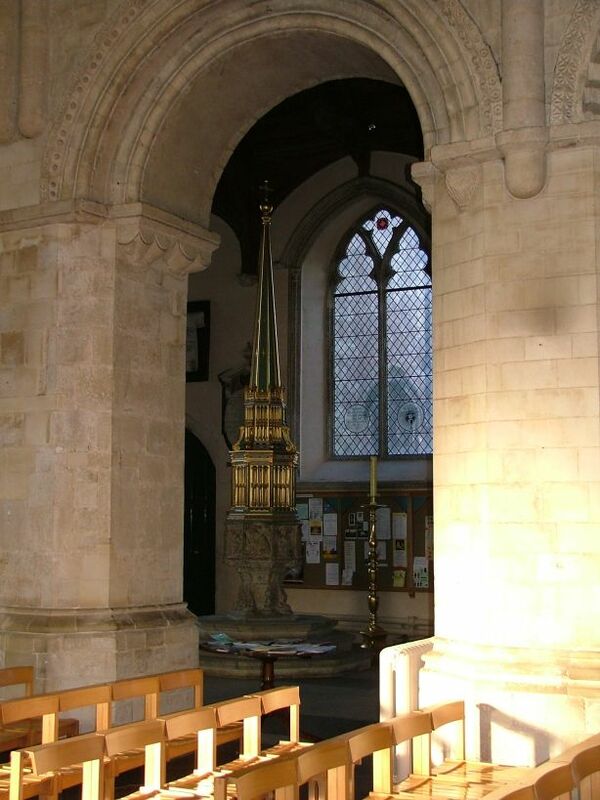 The central crossing tower, however, was built to the east of the current east tower, the chancel extending eastwards beyond it. 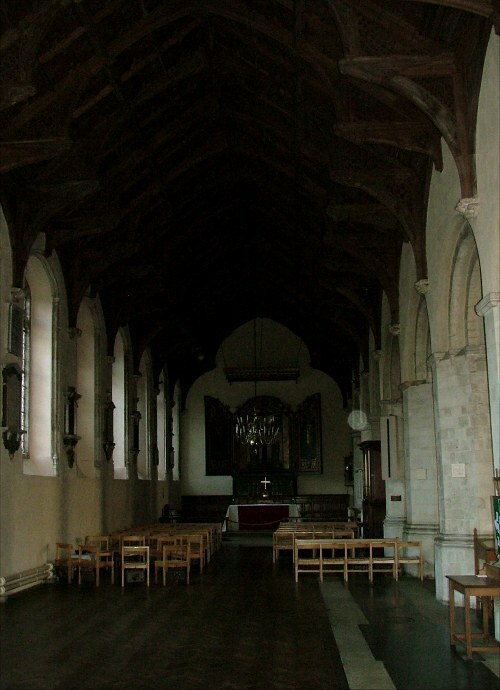 D'Albini intended the church to serve the parish as well as the Priory, but this was not managed without recourse to the advice of Pope Innocent IV, who granted the people use of the nave and the north aisle, the Priory retaining the south aisle, transepts and chancel. 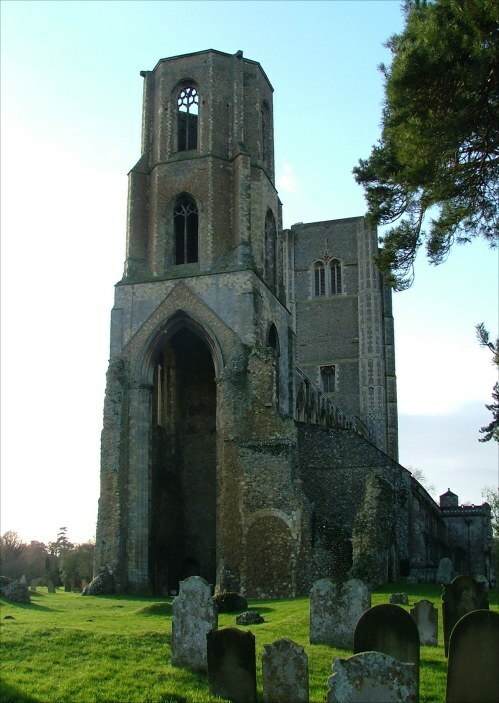 However, when the central crossing tower became unsafe in the late 14th century and had to be taken down, the Priory rebuilt it to the west of the crossing, actually within the nave. This is the east tower that you see today, now a shell. In turn, the parish extended the church further west, demolishing the two west towers and replacing them with the massive structure you see today. 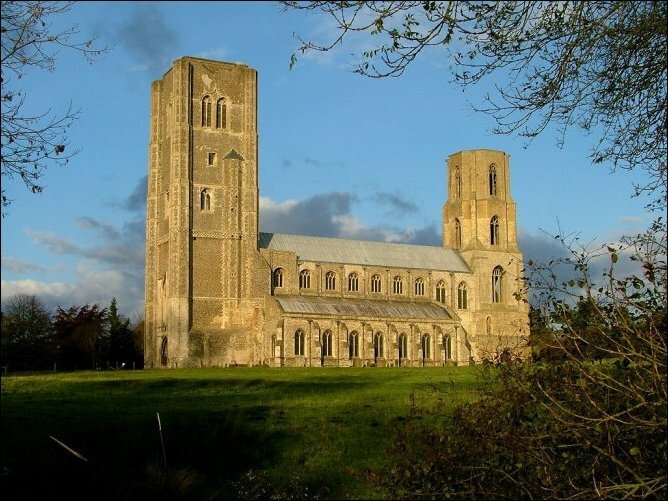 It really is huge; although it is not as tall as the church tower at Cromer, its solidity lends it a vastness not sensed there. 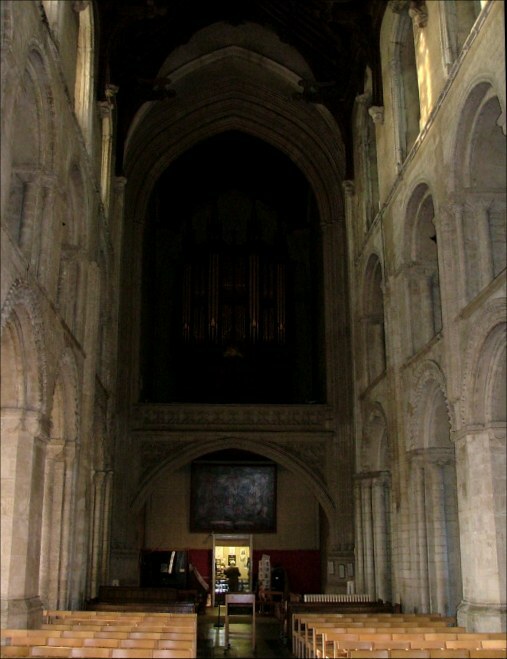 When the new east tower was built, the western face of it cut off the nave from the chancel, creating two separate spaces. 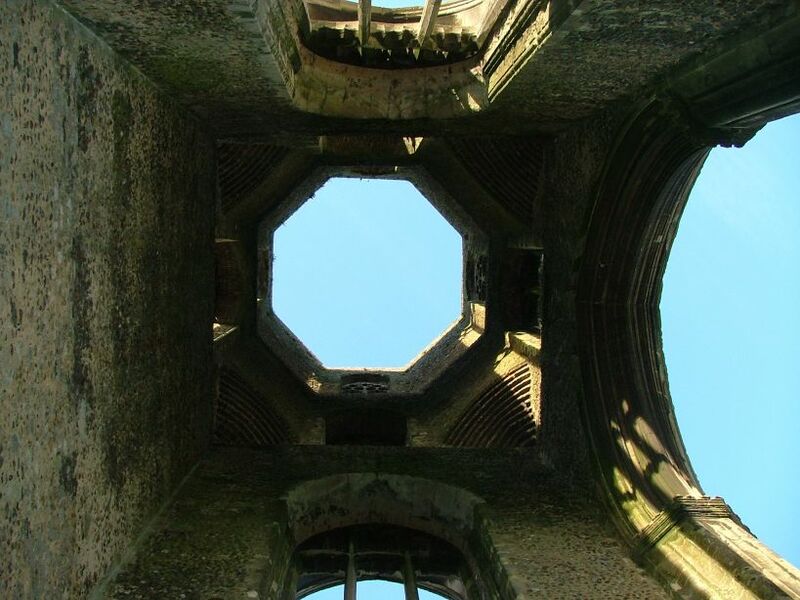 When the west tower was built, it blocked off the former west window between the old towers. 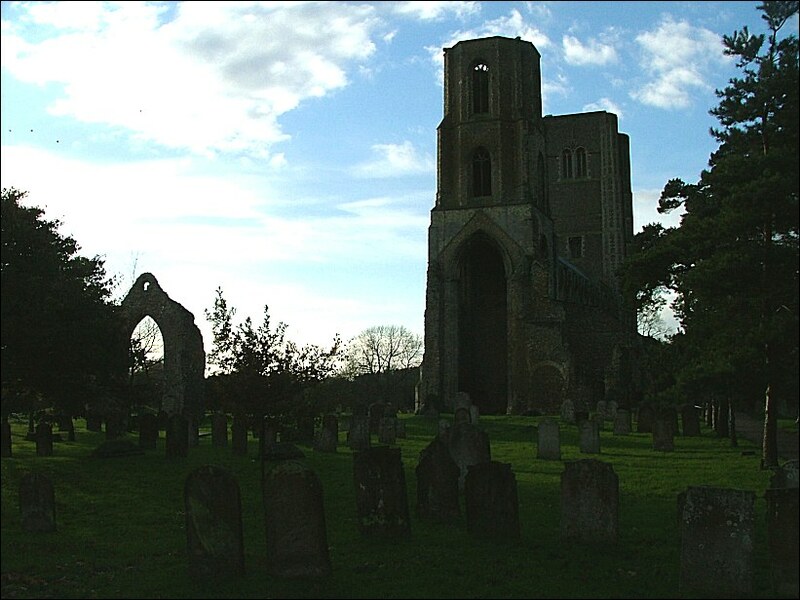 Because of this, Wymondham is the only medieval parish church in Norfolk, and one of the few in England, that has no window at either end. 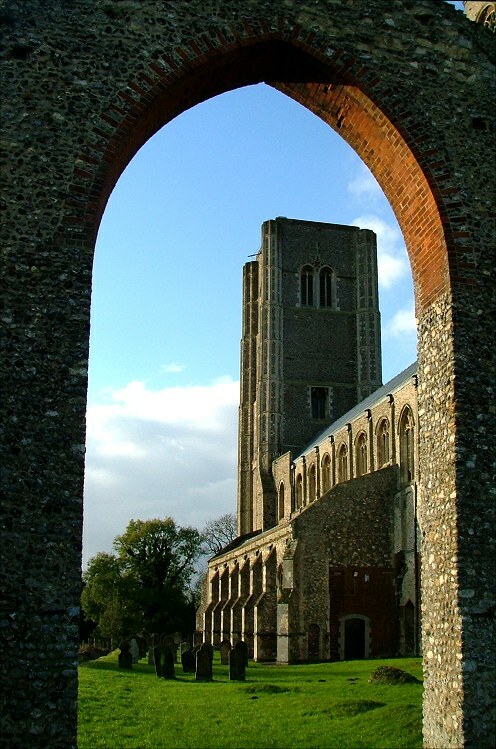 Wymondham Priory became an Abbey in 1448, and seems to have lived its final century peaceably enough before being closed and asset-stripped by Henry VIII in the 1530s. The church then became solely the charge of the parish; the eastern parts, apart from the tower, were demolished. Still without parapet or panelling, the west tower was never finished; but it features in the turbulent history of mid 16th century England because William Kett, one of the leaders of Kett's Rebellion, was hung from the top of it by Edward VI's thought police, a reminder of just how closely church and state became allied during the Reformation. It did give me pause for thought - hanging your enemy from a church tower seems such an obvious thing to do when you want to make a point. I wonder just how many more times it happened to less notable victims over the centuries, on church towers up and down the land? 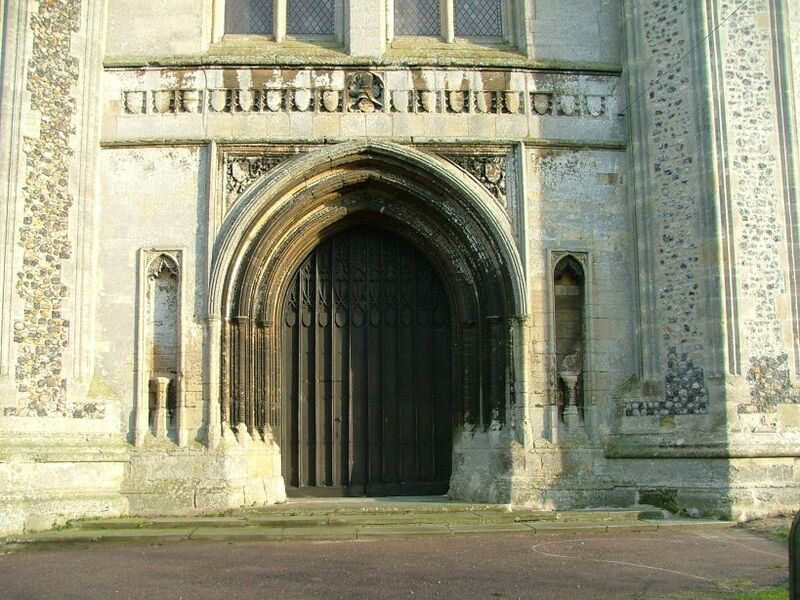 You enter today through the great north porch, which is similar to that nearby at Hethersett, even to the extent of having an almost identical series of bosses. 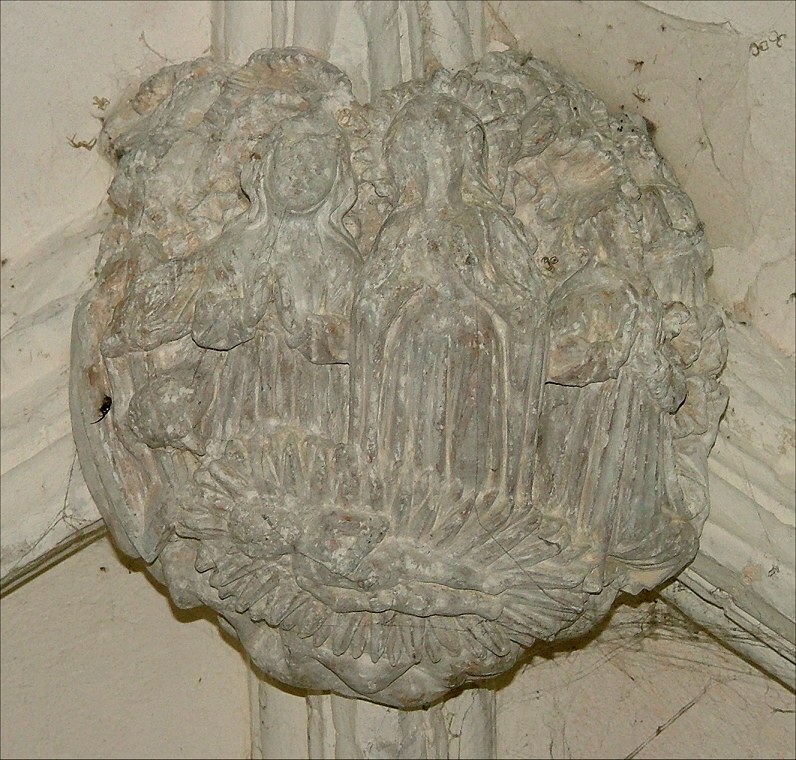 They depict rosary scenes in the life of Christ and the Blessed Virgin. As I said, we came here on a spectacularly cold day, but I was delighted to discover that the interior of the church was heated, even on a Saturday. The church attracts a considerable number of visitors, as you might expect; but I still thought this was a nice gesture. 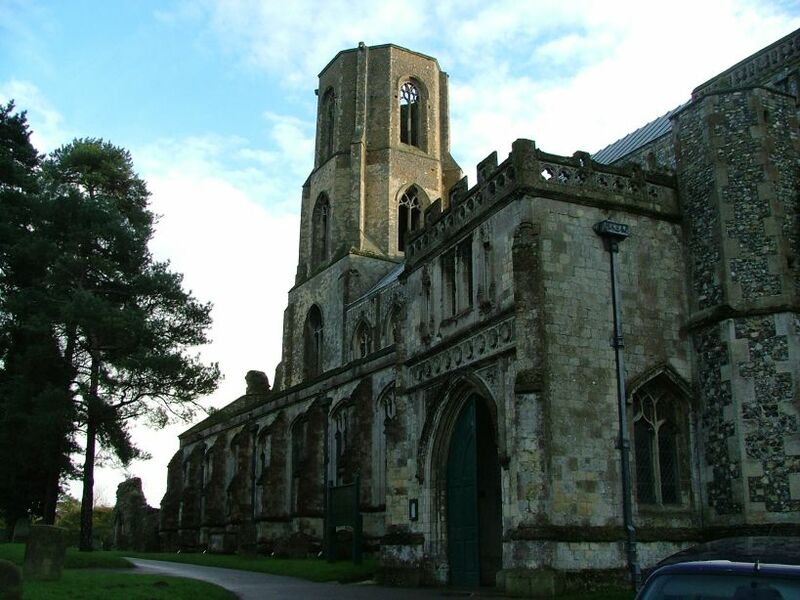 Wymondham church is above all else an architectural wonder; but in many ways this is a simple building, easy to explore and satisfying to visit. 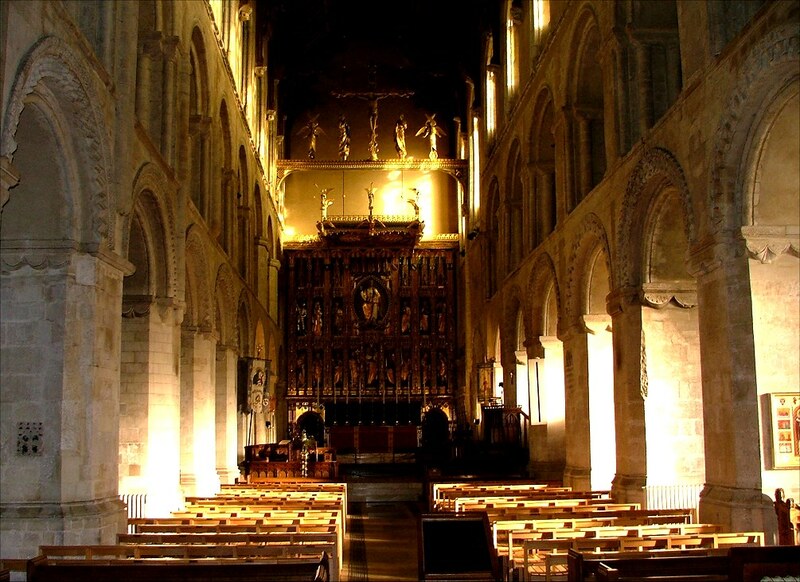 It has the feel of a small Anglican cathedral in that there is a pleasing mix of ancient Norman architecture and modern Anglican triumphalism; as in a cathedral, there are open spaces, and the old pews have been replaced with modern chairs, which almost always seems to work well. The glorious arcading, triforium and clerestory create a sense of great height; this, coupled with the lack of east or west windows, can make you feel rather boxed in, but I found I quite liked that; it made the place seem more intimate, despite its size. 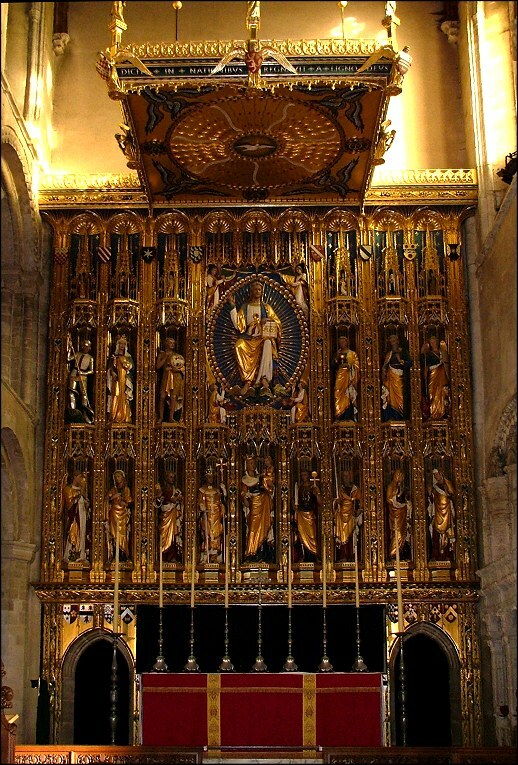 The modern, triumphant feel to the place is largely owing to the vast reredos by Ninian Comper. 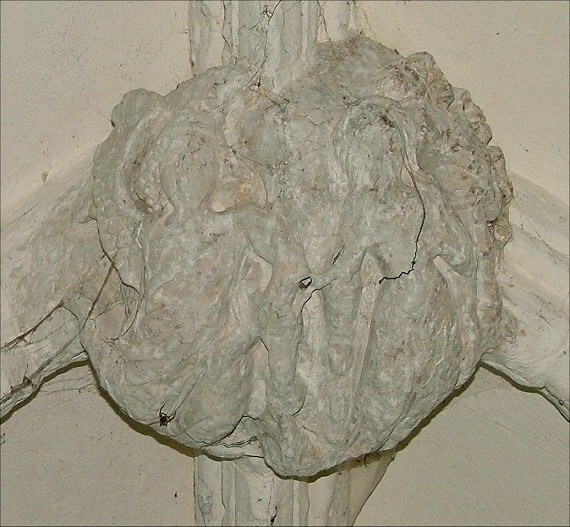 This is generally considered to be his finest single work, and forms the parish war memorial. It was built and gilded during the 1920s and 1930s, and you have to say it is magnificent. 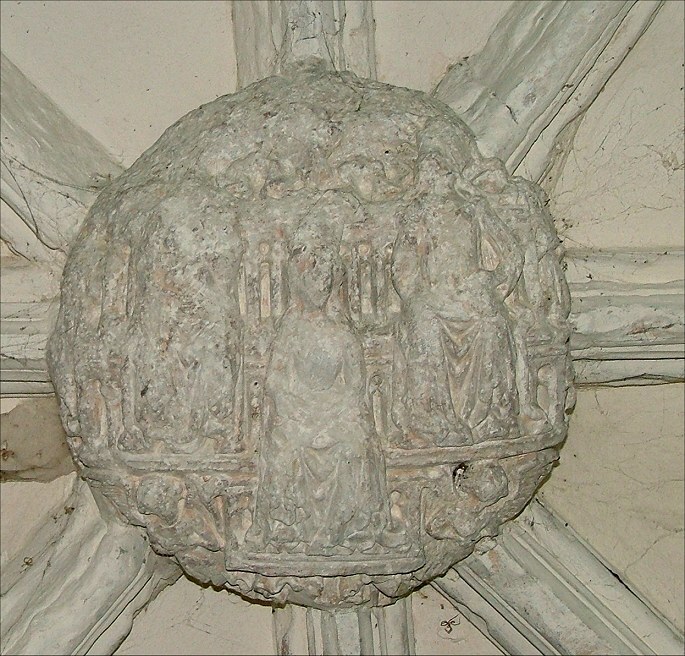 It consists of three tiers of saints, with a glorious Christ in Majesty topping the tiers under the great tester. 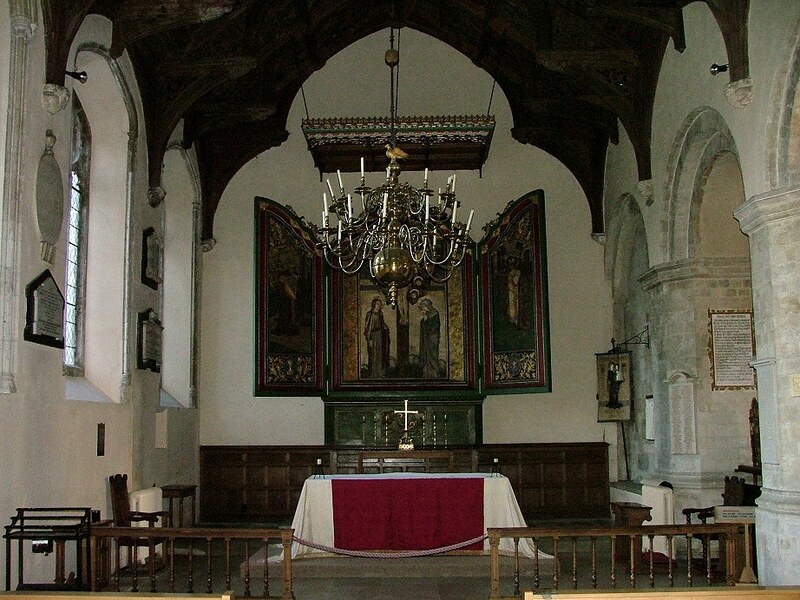 It was never completed; the space where the retable should be is now hidden by curtains. 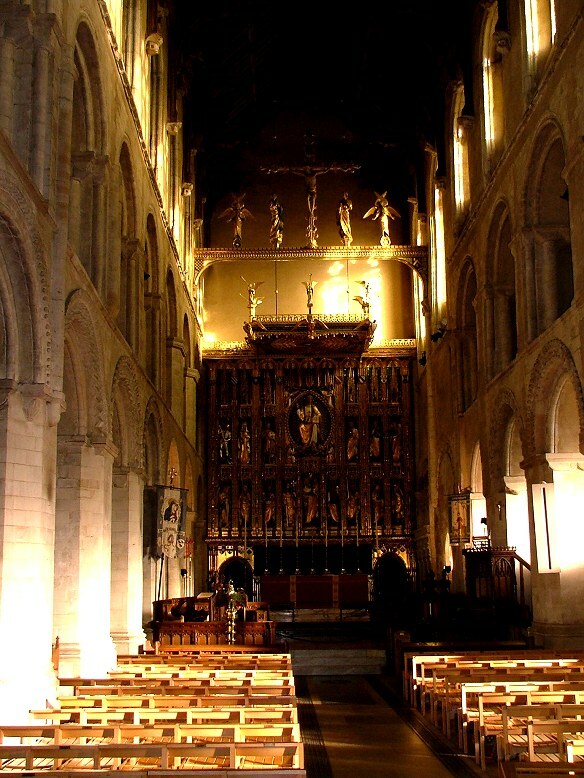 The rood and beam, a bay to the west, is also Comper's work, and it is hard to conceive that work of this kind and to this scale will ever again be installed in an English church. The low sun, slanting through the south windows of the clerestory, picked out the gilding, and clever lighting from underneath helped to put Comper's vision of Heaven into practice. 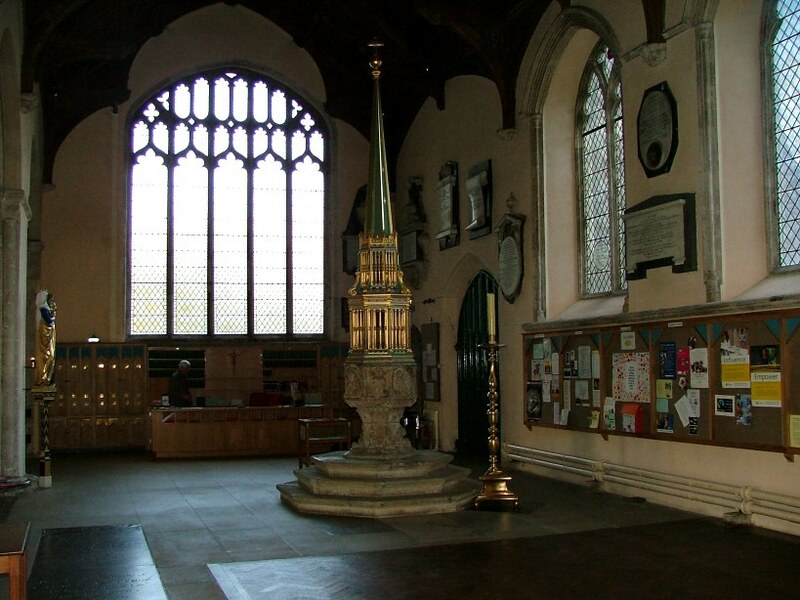 The row of candlesticks on the altar leaves you in no doubt in which wing of the Church of England Wymondham finds itself. Comper's glory shouldn't distract you from the early 16th century facade above the sedilia. 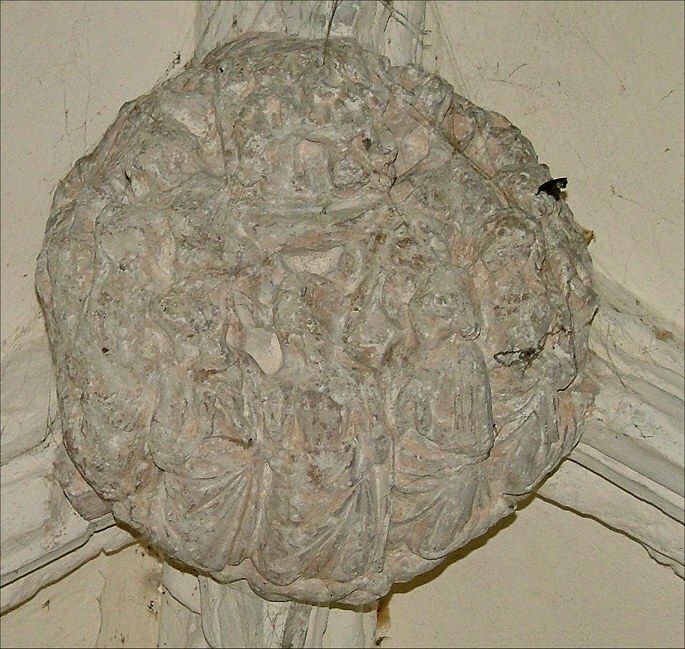 It is terracotta, and probably from the same workshop as the Bedingfield tombs at Oxborough. 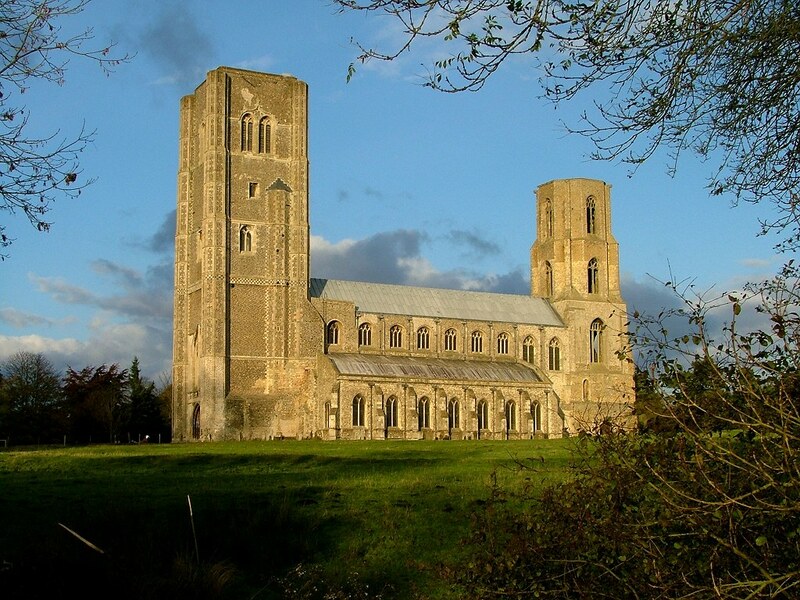 Here you see what might have happened to English church architecture if theReformation hadn't intervened. Looking west from the sanctuary, the original west window is clearly discernible, now home to the organ. If Comper's work is a little rich for you, you may prefer the north aisle, which is wide enough to be a church in itself. 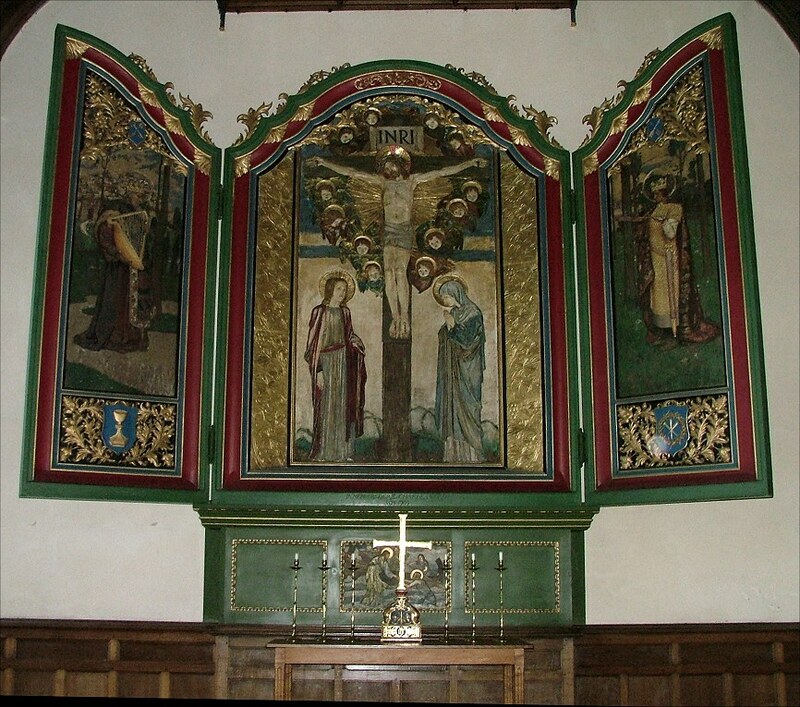 Cleared of clutter, a few rows of chairs face a gorgeous early 20th century triptych depicting Mary and John at the foot of the cross. 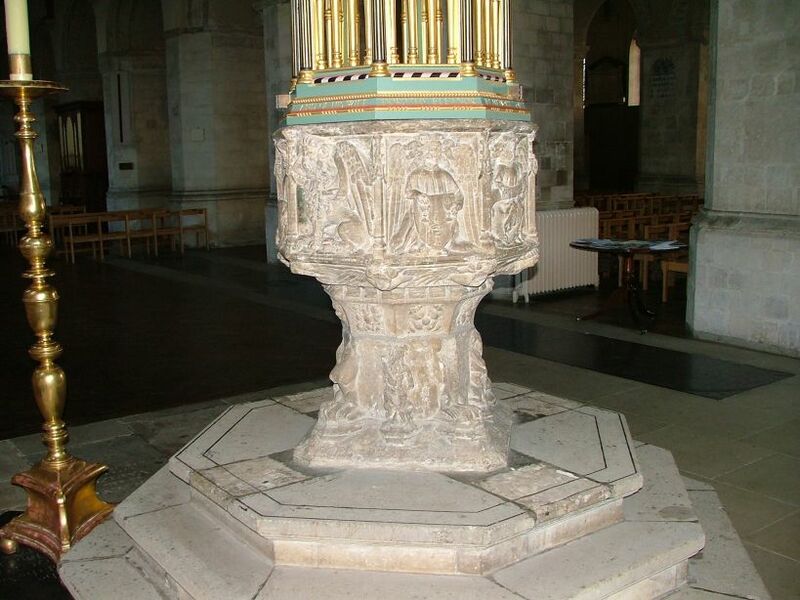 The Madonna and child towards the west is also Comper's, but the 1930s towering font cover on the typical East Anglian 15th century font is not; it is by Cecil Upcher. 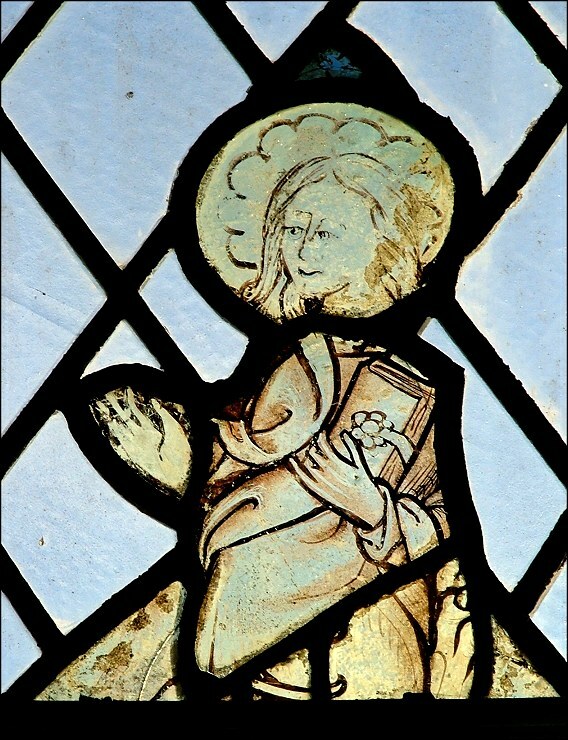 The south aisle is truncated, the eastern bays now curtained off; but here are the few medieval survivals in glass. 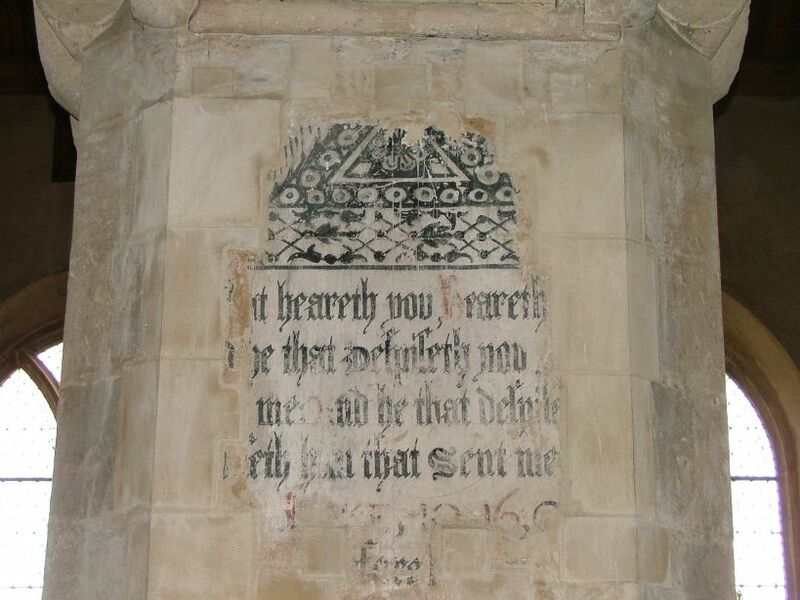 From slightly later, but the other side of the Reformation divide, is an Elizabethan text on the arcade. 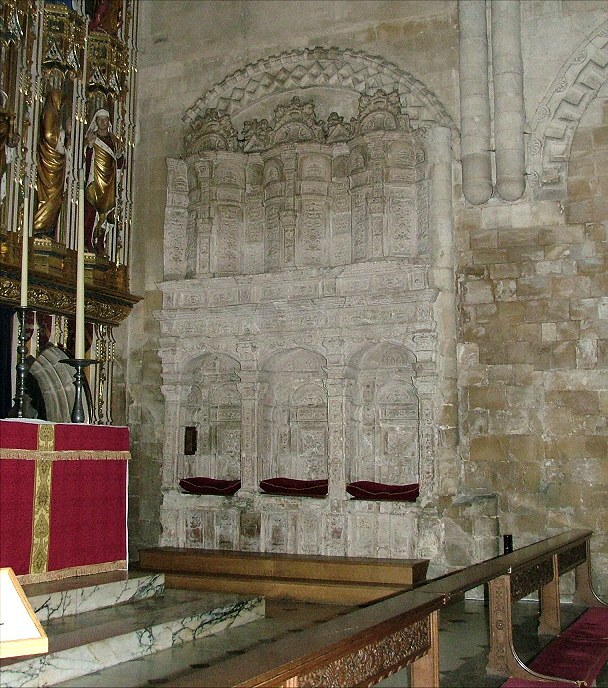 It probably marks the point to which the pulpit was moved by the Anglicans in the 16th century. 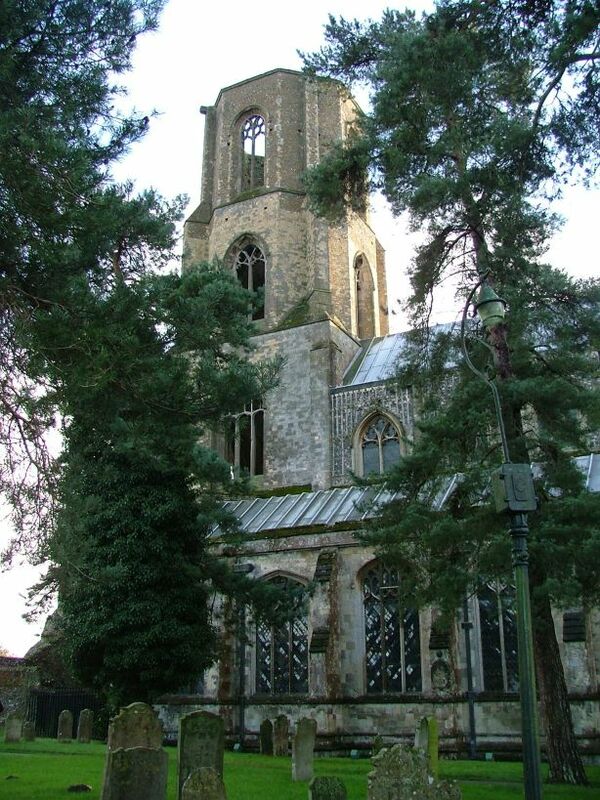 St Mary and St Thomas of Canterbury is a church that it is easy to admire, and it certainly impressed me. Perhaps, it is not so easy a building to love. Inevitably, there is something rather urban in its grandeur, and even the warmth of the heating couldn't take the edge off the remoteness and anonymity you inevitably find in such a space. However, the friendliness of the people on duty helped to make up for this. The area beneath the west tower has been converted into a shop, and the nice lady working there was very chatty and helpful. I have to say that I think it would concentrate my mind a bit, knowing that mighty weight was above me. The shop itself is good of its kind, selling books and religious items rather than just souvenirs, and more icons and rosaries than you would normally expect to find in an establishment of the Church of England. The lady said that she was a Methodist really, and found the services rather formal, but she'd started coming to the Abbey because her daughter went there. "You ought to come, Mum, we're just like real Catholics! ", she giggled, as she recalled her daughter's words. As a 'real Catholic' myself, I couldn't help thinking that we would have stripped out Comper's reredos long ago, and Masses would be accompanied by guitars and percussion, possibly with a modicum of clapping and the help of an overhead projector screen; but I kept my counsel.